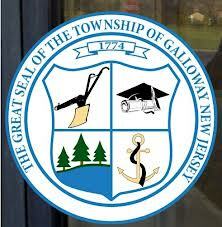 Galloway Township has released a copy of the Council Agenda for the February 12, 2013 Council Meeting. The agenda includes an ordinance introduction to limit the amount of years a Township Auditor can be appointed as well as two resolutions to authorize the payout of accumulated Vacation and Sick leave for former manager Stephen Bonanni and former CFO Jill Gougher. This is will be the third time the resolutions for payout would have been placed on a Council Agenda. Council previously convened in Closed Session to discuss the pair of payouts however tabled both resolutions and requested Township Manager Arch Liston to review the amount of hours and dollar amount to be paid to Bonanni and Gougher. GallowayTwpNews.com previously reported that Bonanni and Gougher were documented to receive in total $124,000 in the payout. The agenda also includes a resolution to approve a settlement of litigation filed by employee Jody Smith in 2012. A settlement agreement released by Township Clerk Thalia TC Kay prior to Council even reviewing and approving the settlement, indicated Smith would receive $250,000. Council still needs to approve the terms of that settlement. Council is also scheduled to discuss an ordinance regarding the appointment of the Township Auditor. Multiple officials have confirmed the ordinance will propose a limit on how many years a Township Auditor can be appointed. Currently, Council appoints a Township Auditor to serve on a one-year contract. Leon Costello of Ford Scott & Associates serves as the Township Auditor and has done so for many years. Councilman Jim McElwee confirmed Council will discuss increasing the term to (3) three-years in order to comply with Governor Chris Christie's Best Practice Guidelines. However, after we reviewed the 2012 Best Practice checklist, a provision as it pertains to Auditor appointments could not be located. After speaking with other Township Officials we were told Councilman Jim Gorman requested this amendment to limit the years an Auditor could serve. In a request for comment Gorman stated, "I did request this, I think it is a good practice. Leon has done a good job. If council listen to him we would be in a better place." Township Manager Arch Liston confirmed the proposed change and expressed the opportunity to change Auditors every three-years could help reduce the relationships that are built with the Auditor. If Council introduces the Ordinance to change the term of Township Auditor, Council will then hold a public hearing on the Ordinance before a vote to finalize the change. A resolution approving over 8 million dollars of bills is also listed on the agenda for approval. We have included a copy of the agenda and a copy of the bill list below. Council will meet on February 12, 2013 at 6:30 p.m. in Council Chambers located within the Municipal Complex at 300 E. Jimmie Leeds Road. I stand corrected, The State recommendation comes from the State of NJ Office of the Comptroller report from 2008 by Matthew Boxer. It is a 13 page report and recommended guidelines for hiring audit firms.Page 2 addresses terms of service and rotation of audit firms.Thank You for pointing out my error and the oppertunity to correct myself. The recommendation by A. Matthew Boxer, was to procure an auditor through a bidding process every 5 years. It also states that the government shouldn't have an auditing firm for more than 10 years which would be two full rotations. However, he also states he would recommend the State mandate this which to my understanding, hasn't occurred yet.